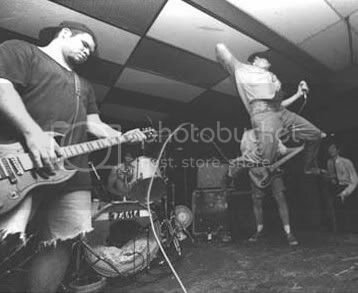 Though it's hard to go against the classic Minor Threat version of 12XU, I'm siding with the New Bomb Turks, whose cover of "Mr. Suit" swings harder than Ray Charles falling out of a DC-10. Yeah, that is a great cover, very different from the original, in a good way! Did you ever hear Die Kreuzen's version of Pink Flag? Thanks for your comment to the blog, pleased yer digging the sounds! Yeah, I remember that Die Kreuzen cover-- I was really into "Gone Away" at that time. I never got to see them live, but they put out some great records.